Bacon Wrapped Stuffed Dates are stuffed with cream cheese and pecans. They are a delicious salty/sweet finger food. They will disappear at a holiday party. These Bacon Wrapped Dates are very easy to make for a party. Remove the pits from the dates if they haven’t been removed already. Stuff them with a small piece of cream cheese and a pecan. Tip: Cut the cream cheese into pieces when it is cold from the refrigerator. Wrap half a piece of bacon around each one and secure with a toothpick. 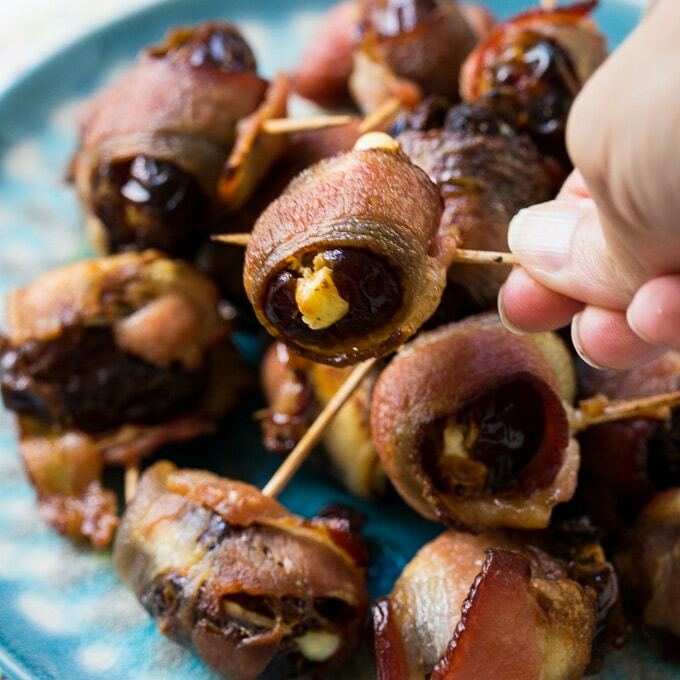 Only 4 ingredients, but these Bacon Wrapped Stuffed Dates have so much flavor. Cooking the dates really softens them and brings out their sweetness which is a great contrast to the crispy, salty bacon. Switch out the cream cheese with goat cheese or blue cheese if you like. Place them on baking rack placed on a baking sheet. Line the baking sheet with aluminum foil for easy clean-up. They need about 20 minutes in a 400 degree oven for the bacon to get crispy. Bacon Wrapped Stuffed Dates are stuffed with cream cheese and pecans. They are a delicious salty/sweet finger food. Preheat oven to 400 degrees and place a baking rack inside a sheet pan lined with aluminum foil. Lightly spray baking rack with cooking spray.